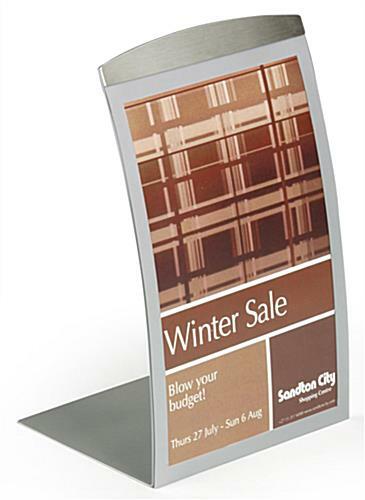 This Picture Frame is Made of Durable Silver Metal and Uses Magnetic Technology to Keep Your Advertisements, Photographs, and Signs in Place! This Picture Frame Features a Modern Design! Wholesale Orders Welcome! 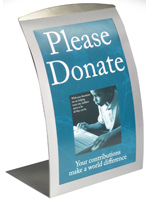 Media Size: 5.5" x 8.5"
8" x 11.5" 11" x 17"
Picture Frame in Silver Uses Magnets to Secure Signs, 5-1/2" x 8-1/2"
This sign holder, picture frame is ideal for holding 5-1/2"w x 8-1/2"h prints. 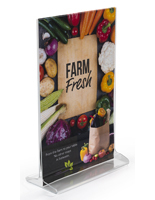 Including a "lift up" design, the picture frame is specially crafted for fast and easy graphic changes. Images are also sheltered by a non-glare, clear lens. 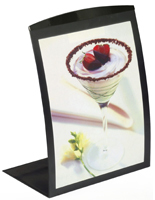 The clear lens permits clients to view your menus, photos and media content, without the images being hindered by glare or reflection. 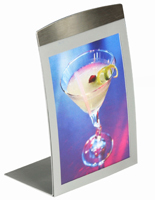 The metal display also incorporates a magnetic border to keep your images in place. Merely lift the lens up and place images underneath. Replace the lens to shelter your images and ensure they will stay in place. This metal holder is an economical way to present your prints. 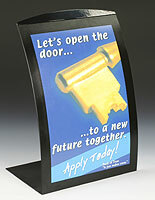 This picture frame incorporates a uncomplicated and appealing design to accentuate any setting. 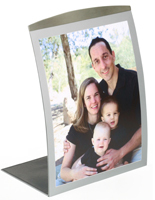 This picture frame, also recognized as a picture holder, is fabricated from aluminum with a silver powder coated finish, enabling it stand out no matter where it is located. 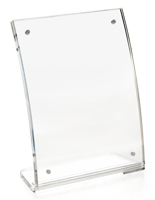 This curved picture frame incorporates a sleek and sophisticated style. 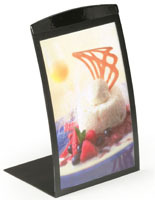 This picture frame can be utilized to showcase pictures, announcements, cards and menus. 6.1" x 6.1" x 4.8"